Imagine a Broadway stage … the orchestra playing its heart out … the chorus line behind you moving in perfect unison … and you in the spotlight, flawlessly executing the choreography of last year’s Tony Award winner. 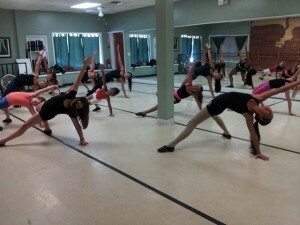 That’s Jazz dance! It’s flowing, rhythmic, hot, lyrical, expressive and FUN! Register for a Jazz class and learn some of the moves that keep Everything Goes dancers in the winner’s circle at competitions and festivals throughout the region. Jazz classes are offered for students aged 7 – adult. Dress Code: Dance tights or black dance pants/shorts; leotard; black jazz shoes (purchased from a dance boutique).